On the occasion of the ISH 2017, the iF Industrial Forum Design honoured Oventrop for twelve iF awards they were granted during the past 25 years. The iF Industrial Forum Design presented a certificate to the repeated award winner Oventrop on the ISH in Frankfurt. The company has been participating in the discipline “design oriented product development” of the iF Design Awards since 1992. 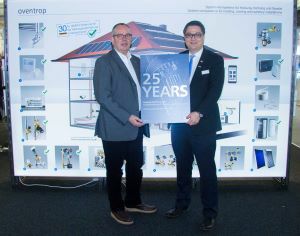 For their products, for instance the exclusive cabinet “Regubox” or the thermostat “pinox”, Oventrop has received many awards during the past 25 years, amongst others, in the categories “product design award”, “universal design award” and “Ecology Design Award”. During the annual iF design competition, about 60 renowned experts from more than 20 countries judged the quality and design of different products. The iF award is an internationally recognized seal of quality for outstanding design.